This month, we've got two things for you! First off, an exciting announcement about our next upcoming podcast project called Silver-tongued Cypher! It's about rap-battling mages ans is set in the Irregulars universe just like our first podcast was. Sit down with your copy of The Irregulars and refresh to be ready for get ready! We'll let you know when the first episode is out! And second, we have a guest post from our publicity intern, Elica Starr! She's about to give you all the in's and out's of how authors are using Instagram--and also talk a little more about Dal Maclean's Object of Desire. Stay tuned next for Elica, and I'll see you in June for Pride! As masters of language, writers thrive on text-based internet platforms. Take Twitter for example: its 280-character limit has become its own literary genre, honed by witty writers of the social media era. What’s more surprising is the fact that authors are also slaying the Instagram-game! Though it’s a form that favors aesthetics over text, contemporary authors are increasingly realizing the potential of an Instagram following, and their readers have never been happier. Perhaps you’re a writer who groans at the phrase “A picture is worth 1000 words.” Maybe you’re a traditionalist — who’s more comfortable wielding a typewriter than an iPhone camera. Regardless, if you’re a writer who hasn’t taken advantage of this picture-posting platform, you might want to consider it. Whether you’re an up-and-coming poet working on your debut collection or a seasoned novelist working on your third spin-off series — here are a few reasons why you want to start ‘gramming. Let’s get the obvious point out the way — any social media platform is an outlet for advertising, and an Instagram profile is yet another great place post the link to your Amazon pre-order page. But aesthetic marketing photos also prove wildly effective for authors promoting their newest novel. For instance, consider taking a picture of your novel and experimenting with placement. The literary community on Instagram has a fetish for book pics featuring foamy cappuccinos, comfy bed covers, and cluttered bookshelves — anything that taps into the cozy souls of your readers. And the best part about it — these pictures are effortless to capture. Take your novel out on a coffee date to a local cafe, prop it up against your venti chai tea latte, snap a pic, and post away. Another way to market your writing on Instagram is by showcasing a few favorite lines in the form of visual quotes. Aestheticizing a quote with a particular font, color scheme, and photography can create a striking visual that conveys the overarching vibe of your novel. 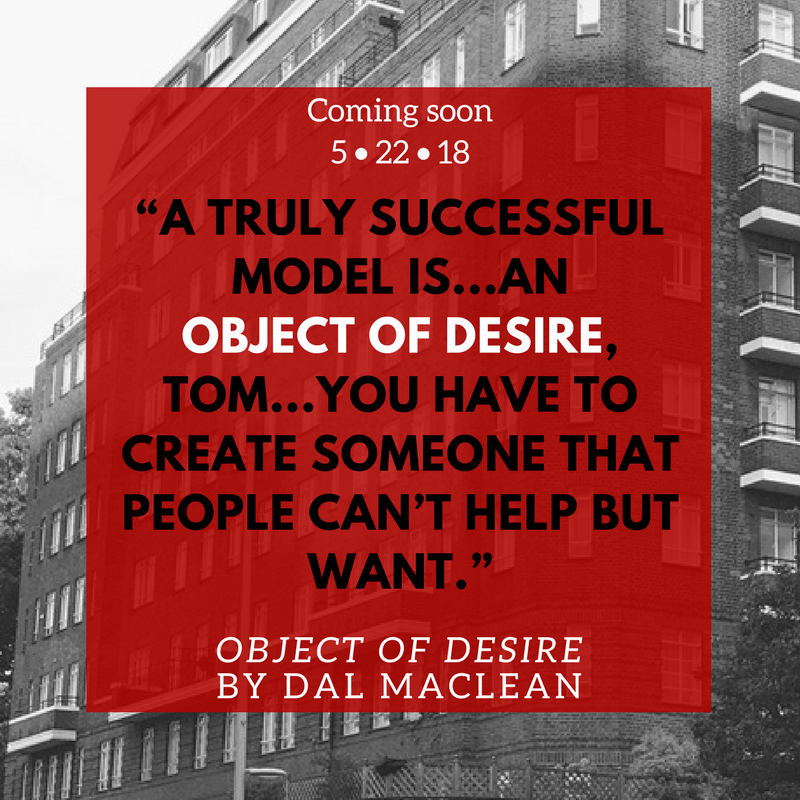 I recently collaborated with Blind Eye Book’s author, Dal Maclean, in creating some promotional visual quotes — using black and white photography of London, brilliant quotes from her upcoming novel, Object of Desire, and a touch of accent colors. In doing so, we transmediated some powerful writing into eye-catching postable Instagram content that conveys a thriller-romance-vibe upon first glance. Instagram isn’t just about the advertising — it’s also about building a personal relationship with your following. And now more than ever, readers are invested in the personal lives of their favorite authors. Grant your readership a glance into your passions and proclivities. Not only will you appease their curiosity, but you can build credibility as a writer and author. If you write about French cuisine, for example, post that picture of the Bouillabaisse and Crème Brulée you cooked the other night. If your novels are set in Japan, dig up those pictures you took on your last visit to Fushimi Inari-taisha shrine. If your protagonist has a penchant for cats, post some cute cat pics! By proving that you know what you’re talking about, you can build trust with your readership. You might even hint at upcoming writing projects by posting pictures of your current inspirations, covertly preparing your audience for what’s to come. Although a messy writing desk may not seem like post-worthy content, the fact of the matter is many readers romanticize the creative chaos that is the writerly life. The iconic clutter, scribbled shorthand notes, paperback stacks with underlined passages, scattered writing utensils (extra points if there’s a quill pen thrown in the mix), nostalgic polaroids and ripped pages, you name it. Literature-enthusiasts follow writers for a reason — and more often than not, they are itching for a peek into the creative process. Whether you keep your workplace tidy or tumultuous, whether you work from an office or your dining room table — a picture of your workplace says a lot about you, and your readers will appreciate the authenticity. The literary community on Instagram continues to grow as authors migrate to the platform, so engage with your fellow writers and fans! Plenty of authors share in each others’ successes and promote each others’ upcoming publications. Book lovers post “favorite reads” by creating aesthetic book stacks and taking pictures of the titled spines — tagging each author featured. Fans engage with their authors by posting their book purchases, reviews, and fanart. And authors can reciprocate the support by reposting these pictures. There are entire communities united by the use of the same hashtags. The more entwined it becomes, the more the literary community thrives — which also results in driving potential readers your Instagram feed. Along the way, you might even create some lasting friendships with authors you currently admire. It’s true that for some wordsmiths, Instagram may not seem the most intuitive — but the publicity, connections, and communities that the platform has to offer is worth giving it a try. Take a gander at the many ways authors are uniquely utilizing the space to represent themselves and their work. Delve into the writer community, shout out a few of your favorite authors, and cozy up into some niche corners of the platform. Above all else, remember that posting doesn’t have to be a strenuous activity. Display your writerly lifestyle in all of its glory, and #booklovers will be double-tapping in no time.